Our day at Whitley Bay was especially memorable thanks to the warm, sunny weather. What a perfect day to be beside the seaside! It was not surprising that thousands took the opportunity to visit the car rally. And we were so impressed by the way the old toilets at Watts Slope had been refurbished. We look forward to attending the classic car rally next year to see how the rest of the promenade area has been transformed. This year, however, there was fencing between the car rally site and the beach due to that work being in progress. Good food and drinks were easily available at Whitley Bay, but for the classic car rally at Beamish it was better to take a picnic. From experience we knew there would be long queues at any food outlets at the Beamish Museum. For most of the time we had good weather at Beamish – except at lunch time. Then, in the best of British style, it rained, and everyone ran for cover. There’s so much to see at Beamish besides looking at all those cars dating back to the 1920s. It is a great day out and another favourite in the Mercedes-Benz Club calendar. 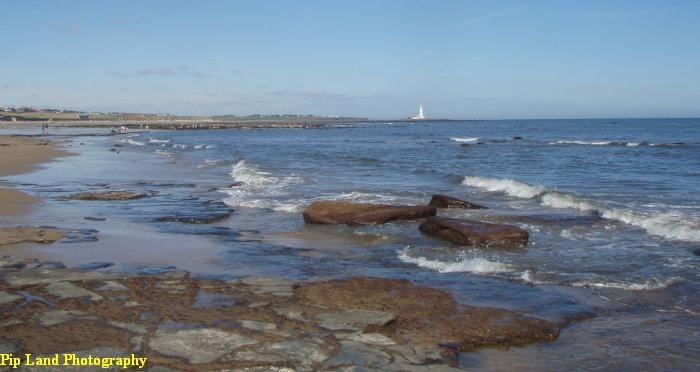 Below: low tide at Whitley Bay meant there was a quiet place to sit and enjoy the seaside.